A mobile mammography unit allows medical industries to expand their services past their fixed facility and reach further into the community. What is a mammogram? A mammogram is an x-ray image of a female breast. There are two types of mammograms. The first type is a screening mammogram. This is used to make a possible early detection of breast cancer in women who have no signs or symptoms of the disease. The second type of screening is a diagnostic mammogram. Diagnostic mammograms are used to check for breast cancer after a lump, sign or symptom of the disease has been detected. This type of mammogram will be lengthier due to more x-ray images taken and deeper magnification of suspicious areas. Where does Aleph Group Inc. come into the picture with a mobile mammography unit? Aleph Group Inc. designs and manufactures a variety of specialty vehicles including; mobile command center, mobile offices, mobile clinic, mobile dental unit and mobile kitchens. A mobile mammography unit would include an exam room with a mammography machine for mammogram screening, along with all essential medical equipment to complete screening. These mobile mammography units can reach patients that would have been restricted by some circumstance before. Early detection screenings can help reduce the amount of deaths among women with breast cancer ages forty to seventy-four. 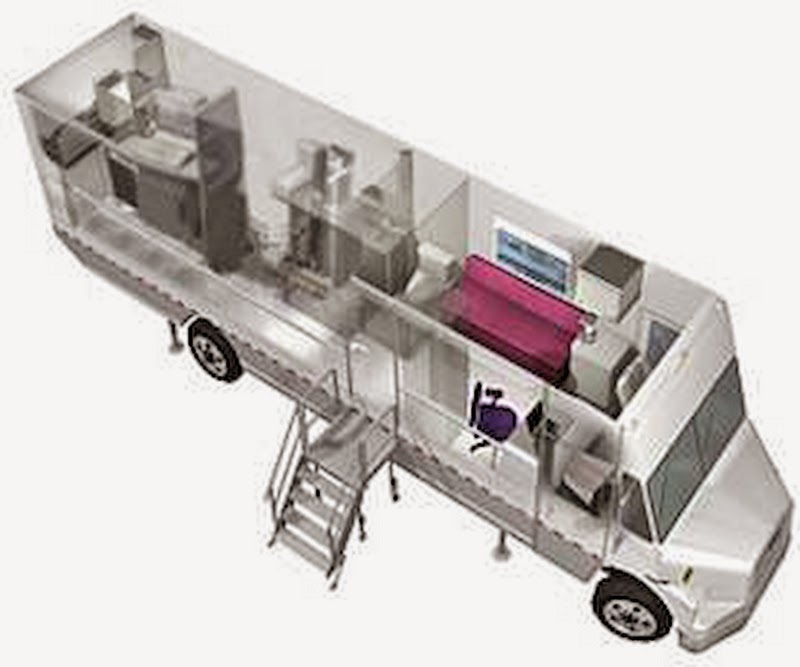 Manufacturing some type of mobile radiology unit is common among the medical industry, with hospitals wanting to expand their services to their patients and the community. Aleph Group Inc. is proud to work with such partners that want to develop a mobile mammography unit and make an impact in their community. Designing and manufacturing specialty vehicles that enable businesses and organizations to expand their services gives AGI tremendous passion and drive for innovation. Aleph Group Inc. and the craftsmanship for manufacturing the best mobile mammography unit and other specialty vehicles is what make our mobile units stand out. Aleph Group Inc. wants to hear from you. Tell us your stories our eye witnessing of a mobile mammography unit and how it has impacted you or your community. “At Aleph Group Inc. we experienced the power of human potential and are committed to exploring the possibilities of growth with everyone who comes in contact with us.” – Aleph Group Inc.